This study compares the impact of different modes of cortisol replacement therapy on the health perception and general well-being in patients with primary adrenocortical failure. 14 adults (8 ♀, 6 ♂) with Addison's disease on chronic cortisol replacement participated in the study. In a randomized double-blind cross-over design, all patients were treated with 3 modes of cortisol replacement for one week each (mode I: 20 mg hydrocortison (HC) at 0700 h and 10 mg HC at 1900 h; mode II: 30 mg HC at 0700 h and placebo at 1900 h; mode III: placebo at 0700 h and 30 mg HC at 1900 h). Following the third week, the replacement modes were repeated in a different random order. For quality-of-life assessment the patients completed three different questionnaires (Addison-questionnaire, Basler Befindlichkeits-Skala, Beschwerde-Liste) and were interviewed about their general contentment at the last day of each treatment week. General well-being in terms of subjective contentment was best established during mode I (in 64% of patients) and less often stated with mode II (in 29%) and III (in 14%) (p < 0.05 mode I vs III). With the twice-daily replacement (mode I), sum scores of all questionnaires were changed towards improvement compared to both once-daily regimens (p < 0.05 vs mode II and III), but did not reach normal values of healthy subjects. Differences between mode II and III were insignificant. 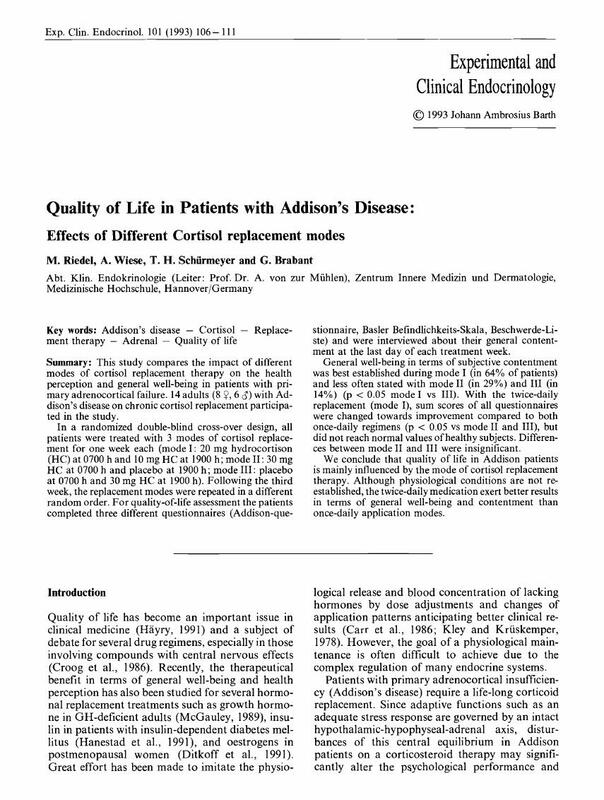 We conclude that quality of life in Addison patients is mainly influenced by the mode of cortisol replacement therapy. Although physiological conditions are not reestablished, the twice-daily medication exert better results in terms of general well-being and contentment than once-daily application modes.